William was born at Heaton Chapel, Cheshire,on 3 June 1894 and baptised in the local Wesleyan Chapel on 21 June. He was the son of Reginald (Commercial Traveller) and Annie Prichard (née Smith) Weaver, and had an older brother, Stanley, and a younger sister, Doris Prichard. The 1901 Census (RG 13/3311) lists William as 'Kenneth', accounting for his name entry on the Buxton Memorial. The family were living at 2 New Hall Street, Macclesfield, Cheshire, but there appears to be no record of any of the family on the 1911 Census. 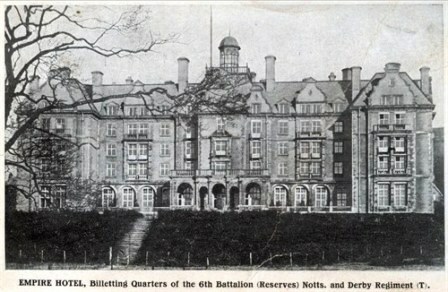 Presumably, at some time between 1901 and his enlistment Kenneth and/or his family moved to Buxton, although Probate Records give his address as 36 Beech Lane, Macclesfield. His estate was left to his sister, Doris, and amounted to £94. 19s. 3d. [£94.96], a relative value of about £4,643.00 today (2014). Kenneth enlisted into the Sherwood Foresters (Notts and Derby Regiment) on a Short Service attestation at Buxton. His Service papers have not survived and his medal Index Card does not give a date for when he was posted to France, but as he was not eligible for the '1915 Star' medal it must have been after 1915. However, by comparing his Service Number with others whose records have survived, it looks very likely that Kenneth enlisted for 4 years in the 2/6th Battalion, Sherwood Foresters, in early July 1915, probably moving to the Training Reserve. It seems that William Kenneth was a "Derby Scheme" man with an original 4-digit number 4754. January 1917, to Fovant and landing at Boulogne on the 25th February 1917. 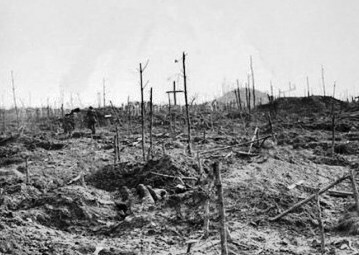 During the Third Battles of the Ypres (31st July - 10th November 1917) the 2/6th Battalion were engaged in several phases as part of the 178th (2/1st Sherwood Forester) Brigade, particularly The Battle of the Menin Road Ridge, 20th - 25th September. The 2/6th took part in The Battle of Polygon Wood from the 26th to 29th September and they were forward of Wieltje. The War Diary shows that from the 1st to 19th September 1917 the Fighting Strength of the Battalion was "Officers 18; O.R. 's 816", and that it was training North of Winnezeele (about 25 kms. West of Ypres). On the 20th the Battalion practiced for an attack scheduled for 5.50 a.m., 26th September, and at 6.00 p.m. marched to the trenches and four hours later relieved the 2/5th South Staffordshire Regiment in the front line running from Gravenstafel Road to Downing Trench. "5.50 a.m. - After heavy artillery barrage Battalion left its kicking off position, with 2/7th SF on the left and the 177 Bde on the right. The objective which was from D14d36 inclusive to the Gravenstafel Road (exclusive) was reached about 7.30 a.m. A number of prisoners were taken. 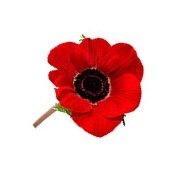 The enemy shelled our positions during the day." Battalion sustained 11 Officer and 220 other rank casualties, many from continuous enemy shelling. 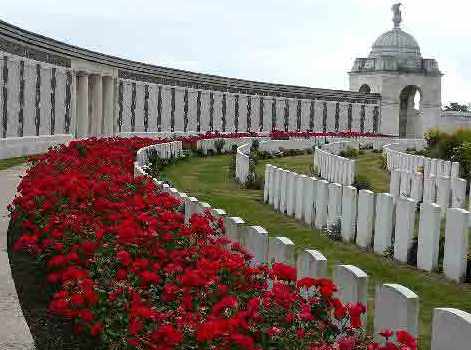 September) have no known grave and are commemorated, with Kenneth on the Tyne Cot Memorial. · I am grateful to Frederik Sohier for the photo of Kenneth's grave. · I am also grateful to Colin W. Taylor for the War Diary extract. · .... and to Mike Briggs for the information on the re-numbering and Derby Scheme. ..... about the "Derby Scheme"